So Brendan Eich’s short tenure as Mozilla CEO has come to an end (report from TMO). The short version is that he donated money to the campaign for Prop 8 in California, an unconstitutional (it turns out) marriage discrimination law (i.e. a gay marriage ban). Since being appointed CEO, Eich has come under ever increasing pressure over his anti-gay stance, with pressure on him to either evolve on the issue, or step down. He made it clear he was not changing his mind on being pro-discrimination, but insisted it wouldn’t affect how he did his job. That wasn’t good enough for the community, and in the end he bowed to the pressure and resigned. I have skin in the game here, I’m a long-time FireFox user (since before it was even called FireFox), I’ve donated to Mozilla, and I’m a pseudo-married gay man. You can take it as read that I’m not in favour of homophobic laws like Prop 8. You might also imagine that I’d have been straight in there in the chorus of people looking for Eich to step down, but I wasn’t. I had to think long and hard about whether or not it was right to ask for his resignation. My distrust of mobs and my dislike of witch-hunts came into conflict with my abhorrence of discrimination. I needed to figure out the morals of this before I said anything publicly. This week’s Insgragram TOS kerfuffle is nothing new. Instagram is not the problem, it’s just the latest symptom of a sick business model that has been allowed to become so dominant as to be almost un-challengeable – services on the web MUST be free, so you MUST give up your privacy and/or your intellectual property rights to enable the service providers profits. If you dare stand up for privacy then you are a greedy idiot who wants something for nothing, and you need to grow up and let the companies make money. My problem is not that companies want to make profits, it’s their instance on selling our data to do it that I have a problem with. How about this for an idea – why not let people pay for services rather than insisting we all whore out our privacy and intellectual property? It’s not the Flip-flopping, it’s the Dishonesty! It’s primary time in the US, and Mitt Romney is running again, so of course you can’t drown out the chorus of pundits denigrating him for being a ‘flip-flopper’. It would appear that in the mind of much of the popular press on the west side of the Altlantic, keeping an open mind is an unforgivable crime! Before you all think I’ve gone mad, I am NOT saying Mitt Romney is great, I’m saying the problem with him is not THAT he changes his mind, but his dishonesty about his many reversals. A good leader will be guided by his core principles, and reality. His principles should not change, but reality does, inevitably, and eternally. As reality evolves, the best avenues to peruse your principles have to evolve as well. If you want to live in a well run country you should applaud political leaders who have the courage to re-evaluate their plans and proposals as situations evolve. Has Belgium Hit the End of the Road? I’m annoyed today. Very annoyed. I think we’re witnessing the demise of the country which I am proud to be a citizen of – Belgium. There’s no doubt that it is, and always has been, a strange place. It was a purely made up country that had nothing on common apart from a shared Catholic faith, and the newly appointed king. I don’t know of any other country where there is no common national language. The struggles between the Wallonians and the Flemish has been long and complicated. 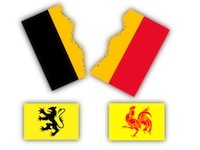 Despite being a physically tiny nation, Belgium has become a Federal State, with a national federal government in Brussels, and local ‘state’ governments in Brussels, Flanders, and Wallonia. The local governments are all working just fine, they have administrations in place, and are getting on with the job of running their respective parts of the country. The problem lies with the national federal government. We have had a string of unstable governments for years now, often with very long gaps between elections and the eventual formation of short-lived and turbulent administrations. When the previous government collapsed last spring, elections were called and held in June. Since then, there have been on-going negotiations to form a government, and they have not gone smoothly. Today, for what feels like the millionth time, talks collapsed, and the King’s mediator has handed his resignation to the King. If you’re wondering why there have to be negotiations, the reason is that there are no nation-wide parties in the Belgium. There are Flemish parties and Wallonian parties, and although there is a Flemish Green Party and a Wallonian one, they are not the same party, and don’t work together. The constitution sets this division in stone mandating that governments consist of coalitions of Flemish and Wallonian parties. Why do we Need Marriage Equality? This is why! I’ve never broadcast details of my love life on this blog or on the many podcasts I contribute to because frankly, my personal life is, well, personal. In this case though, I’m going to make an exception. Why? Because of the relevance to the tragedy I want to draw your attention to. I’m in a committed loving relationship with another man. We’ve been together for over 5 years now, and we’re building a life together. We just want what every couple want, some basic recognition of the fact that we are a family. This is what the fight for marriage equality is all about. It’s about the simple things like hospital visitation rights, inheritance rights, and so on. It’s inevitable that one day one of us will get sick, and when that day comes, we’ll want the right to visit each other, and to make medical decisions for each other should one of us not be capable of making those decisions for ourselves anymore. Should one of us die before the other we want our worldly possessions to go to the remaining partner without question or taxation, just like it happens for regular couples. These are very simple things, but very important things. I may have stumbled in to Catholicism as an accident of birth, but I’ve since picked myself up, dusted myself off, and decided that I want nothing to do with such a profoundly corrupt and power-hungry organisation. Nothing about the RCC gels with the person I am. I believe there is nothing more dangerous than blind faith, while the RCC literally preaches it as a virtue. I believe each person should be free to explore their own spirituality, while the RCC believes it and it’s priests are there to tell the people how to interpret the bible, because ordinary people are too dumb to do it themselves. Before I explain my thinking on all this, I want to set the scene. I do work in the public sector, but I’m not a civil servant. I work in a university. I am on strike today, but I’m not out on the picket line. I voted against strike action, but I believe in democracy, so I’m respecting the strike, though not actively supporting it. It is true that people at the top of the public sector earn very high wages, but that is not true of people all the way down. To be honest, it’s just like the private sector. The plebs at the bottom struggling to pay their bills, and the fat-cats at the top compensating themselves generously. It’s also true that I get a good pension, but, it’s not a free pension. I pay for it each month, and on top of actually paying for my pension, I have to pay the pension levy too. God and the Bus Wars – Can You Say Hypocrisy? There definitely is a God. So join the Christian Party and enjoy your life. Now, it’s important to stress that the organisation which filed the complaint against the atheist bus slogan is not the same organisation that is paying to have the above ad put on buses. It was Christian Voice which objected to the atheist add, and it’s the Christian Party which is paying for the above ad. Now, the question has to be, will Christian Voice lodge a complaint against the Christian Party ad? Or are they happy with a double-standard if it’s a pro-Christian double-standard? If you’re not in the mood to “hear” me rant, best move along to another part of the blogo-web now because ranting is certainly something I’m going to do. The incompetent morons we are unfortunate enough to call a government have decided that the solution to their incompetence is to steal money from nurses, teachers, Gardai (Irish Policemen) and other government workers on the pretence of paying for the pension we already pay for! No one can deny that the government finances are a mess, or that the books needed balancing, but this is a dishonest and down-right unfair way of doing it. As is typical for our government, they haven’t got the balls to do things the honest way, so it’s done through stealth taxes. We have a taxation system for a reason, to bring in money for the government in a fair and equitable way. It’s full of safe-guards to ensure that those on the lowest incomes pay the least. With the 1-2% income levy on everyone in the countries gross income and now this 7-9% levy on public servants gross income the government are by-passing all the safeguards in a mad dash to make up for their incompetence.